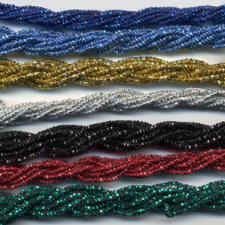 Polyester metallics Kreinik Facets & and the smaller Petite Facets are an easy alternative to using a beaded thread. 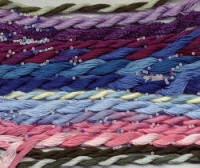 No more frustration trying to thread the beads onto your thread, just couch the Facets onto the surface of any cross stitch, needlepoint, doll making or crazy quilting project to create texture and dimension. Available in Gold, Silver, Sky Blue, Sapphire Blue, Red, Green and Black. 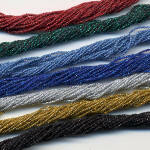 Kreinik Facets & Petite Facets are hand or machine washable and dry cleanable. Cool water is recommended. Do not use bleach. It can also be tumble-dried on low setting. When ironing a finished piece containing Facets, do not iron directly on the thread; use a cloth, and do not use steam. Petite Facets are half the size of our regular Facets. 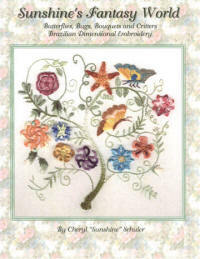 In Brazilian Embroidery the string of facets can be couched onto the limbs of Christmas Trees for a festive effect or to decorate the Christmas ornament designs. There is a multitude of fun things you can do to incorporate this beautiful bead type thread in to any of your embroidered designs. Simply find a matching thread and couch the line of beady thread into place!